As with the Dart family, The Dart Bank is central to the history of Ingham County. Our Charter as a commercial bank dates from April 25, 1925. 1925 was also the year our long-time Chairman-CEO (Rollin Bashford Dart) was born. Dart Bank has been considered a family bank since the beginning, but, in this connection it must be said that the ownership fabric of the bank has changed considerably through the years. The bank’s shares, today, are much more widely disbursed than in earlier days. The bank was founded by Rollin Charles Dart (“R. C.”) and his son, Doc Campbell Dart. Prior to 1925, the bank operated as a private bank and was known as R. C. Dart & Co., Bankers. 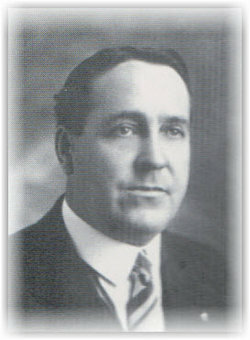 Rollin C. Dart served as the bank’s President until his death in the Fall of 1943. Son Doc then became President and C.E.O. and so served until his death in 1960. The original investors and directors of the bank were: D. G. Barr, local area farmer and later to become the Mason Ford Automobile Dealer. Mr. Barr had earlier migrated, with his family, from Northern Ireland; C. L. Bashford, widely known fruit grower and nurseryman (also the father-in-law of Doc C. Dart); Doc Campbell Dart and his father, Rollin Charles Dart; E. A. Densmore, Attorney, Postmaster, and former Register of Deeds for Ingham County; Claude Edgar, well-known farmer, Aurelius Township Supervisor, and Manager of the Mason Co-op Shipping Association; Eugene R. Edgar (Claude’s brother), successful farmer, and Director of Field Work for the Michigan Sugar Beet Company; O. H. Freeland, M.D., physician serving the local populace; W. G. Grow, local dealer in Grain and Wool; and William S. Rhodes, manager of a firm known as Laboratory Products Company. When the bank received its charter, as The Dart National Bank of Mason, it continued doing business in a building situated in the SE corner of Jefferson and Ash Streets (currently occupied by the Dart Insurance Agency), which had been in the Dart family for many years. In 1937, The Dart Bank acquired the assets and liabilities of the First State Savings Bank, and promptly moved into that bank’s far more commodious quarters, located in the NW corner of the same intersection. Pausing for a moment, there is something you need to know about this building into which we moved in 1937. At the time of moving, Lovicia Dart, wife of Rollin C. Dart, asked her husband if she could select the paint for the new headquarters. Rollin told her she could. Her favorite color was a soft buff. The paint was chosen and carefully applied, but for one reason or another, the paint, when applied, became what could be aptly called an “ice cream pink,” or “candy pink.” The color was much commented upon and that same shade of pink was maintained from then on, until the bank moved to the new building on Park Street, in 1969. It needs to be noted that the period of time, particularly the early thirties, meant tough sledding for banks. We were the youngest of the three Mason banks and we may be proud that all three banks came through the worst of the depression with flying colors. This was most certainly due to the dedicated, tireless efforts of Mason’s bankers and a wonderful community’s faith in its banks. Doc Campbell Dart (D. C. Dart) was not willing to accept the banking business as he found it. He was innovative. The prospects of “consumer” or “installment lending” excited him. He was, it was well documented, the first banker in the U. S. to start lending to facilitate the purchase of automobiles. It is true that the captive finance companies (owned by G. M. and Ford Motor Co.) had started financing cars before Doc, to facilitate the sale of their cars, but not so in the banking industry. Because of Doc’s creativity, our bank was also the very first bank to finance the sale of house trailers (long since called mobile homes). These aggressive moves into the consumer-lending field were not well received by the Comptroller of the Currency’s office in Washington. (The Comptroller of the Currency is the primary regulator of national banks.) Bank examiners met these innovations with alarm and we were ordered to cease such lending. Back and forth, from Mason to Washington, D. C., Doc fought for the right to forge ahead with consumer style lending, and was finally permitted to on a highly restrictive basis. As the practice continued on without any of the dire straits that had been feared, the regulators began to relax their grip. Far from getting us into trouble, Doc always felt that our participation in this form of lending was one of the practices that aided us in getting through the “Great Depression.” The Dart Bank, in those days, was not seeking loans for homes. It became common knowledge that if someone went to the Farmers Bank seeking a consumer type loan that Mr. L. R. White would refer them to our bank, and that if someone came into the Dart Bank seeking a home loan, they were promptly sent to the Farmers Bank. World War II came and the war years were very different. Automobiles were not being produced and people in all walks of life were trying to make do with whatever they had. All who lived through this period were persevering in whatever they could to help America’s part in the war effort (1941 – 1945). Following the war there was a transformation period in which industries were converting from products to further the war effort, to products for civilian consumption. There were too many dollars chasing too few available products and inflation, initially, was rampant. As things gradually returned to a peacetime economy and more and more consumer goods became available, more stability became evident. Our bank prospered as more good loans became available. The American public had lived without many things during the war years and people were “catching up” with the automobiles, appliances, clothing items, etc., that they needed. As the postwar years went on, and our bank grew, and as more employees were needed, we began to feel the squeeze in the space we were in. Prior to 1961 we acquired the property that was situated in the NW corner of Park and W. Ash Streets, still in downtown Mason. The property had been owned by William F. and Ruth Dart and had been used by Dart Manufacturing Company. Before the Darts, the property had been owned by the Kelly Monument Company. In January of 1961, we opened a brand new (and attractive) drive-in and walk-up banking facility on this property purchased from the Darts. 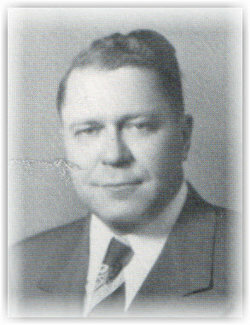 Doc Campbell Dart, who had been Chief Executive Officer since the fall of 1943, passed away in May of 1960. In the fall of 1961, the regulators advised the Board of Directors that the bank was in need of more leadership. In response, Rollin Bashford Dart, son of Doc, left his insurance business on January 15th, 1962, to become Chairman and Chief Executive Officer. At this time, also, William Fisher Dart, brother of Doc, became President and served in this capacity until January of 1964. The title of President was then added to Rollin. During 1967 we began to construct a new banking headquarters. This also was to be situated on the property purchased from the Wm. Darts. Interestingly, excavation for the building revealed a number of discarded stone and marble monuments from the Kelly Monument Company days, long gone by. This building was constructed adjacent to the “butterfly” drive-in and was opened for business on May 12, 1969, with a luncheon open house lasting for one full week. It felt SO good to have the working space to “stretch out” and give things AND people the leeway so much needed. In 1962 the Chairman shared a dream with his co-workers. The directors of the bank shared in the dream. That dream was to establish a banking office in the rapidly growing Delhi Township. Delhi Township adjoins Lansing at the South and includes an area called Holt. Mr. Dart initiated the cumbersome application process and ultimately a location on the West side of Aurelius Road was chosen and subsequently approved by our regulator at that time, the Comptroller of the Currency. In February of 1965 the bank moved a trailer on to the site and began doing business. The American Bank & Trust Co. (AB&T) sued our bank and the Comptroller of the Currency, believing they could defeat Dart’s right to do business in Delhi. The arguments had to do with the so-called village section in the Michigan Financial Institutions Act. The trial took place in the U. S. District Court for Western Michigan in Grand Rapids. Judge Fox ruled in our favor. Not being satisfied and still determined to kick the pink bank out of Delhi, AB&T appealed the decision to the U. S. 6th Circuit Court in Cincinnati. Sadly, the Cincinnati Judges reversed Judge Fox’s earlier decision. In ruling in favor of AB&T the judges made special mention of the poor and nebulous manner with which this section of Michigan law had been fashioned. Mr. Dart made a second trip to Washington to request the Comptroller to appeal the case to the U. S. Supreme Court. The U. S. Solicitor General ruled against this request. Dart Bank morale hit a low point when, after thirteen months of banking in Delhi, we were forced to close. A later attempt to return to Delhi was successful and the bank opened again for business in Delhi, in April of 1974. This second (and final) location is on the West side of Cedar Street, North of the area that is called “Holt,” and immediately South of the city limit of Lansing. The bank operated out of a mobile banking office for more than three years while we were constructing a beautiful, new headquarters style banking building. The working area adjacent to the lobby, including private offices, has since been doubled in size. We knew it had been a gasoline service station in prior years, so we took special precautions early on, from an environmental (pollution) point of view. Notwithstanding our precautions, environmental problems surfaced and ultimately became very costly. Fortunately, negotiations with prior ownerships provided us with substantial expense reimbursement. A long delayed opening of the new facility took place on July 14, 1993, which was enthusiastically received by our friends. At the close of 1993 we lost, through retirement, three persons whose careers, altogether, totaled more than 110 years. Marion Block, Delmer Kramer, and Mary Jane Beaune were dearly loved and respected by employees and customers alike. 1994 was a memorable year for shareholders, in that the bank declared a 200% stock Dividend in the form of a 3 for 1 split. Memorable also for year 1994 was a Return on Equity exceeding 15%. Milestone technology was acquired in the form of Voice Mail, increasing options for customers and efficiency for our employees. “Through these portals pass the most important people in the world – our customers.” These words appear prominently in the lobbies of our three main offices. We must give credit to a man (long gone) named Earl Carroll for this expression. For many years Mr. Carroll had a large theater in Hollywood and the members of his cast (who danced, sang, etc.) were reputed to be the most beautiful girls in the world. So he first said it: “Through these portals pass the most beautiful girls in the world.” This expression of our feelings for our people – employees and customers – will always be with us! Our 70th Anniversary occurred on April 25, 1995, without fanfare. We felt it would be more appropriate to prepare for our 75th. Also, in 1995, the long-awaited IBM AS 400 computer was installed as the bank’s “mainframe,” or central data processor. This took place in May and greatly enhanced our ability to generate information for our customers and ourselves. A review of the years preceding the new millennium, 1995 through 1999, reveals some exciting occurrences within our bank. Beginning with 1995 and the acquisition of a new IBM 400, our technological capabilities increased steadily. In 1996 our ability to sell non-bank type investments and various kinds of insurance became a reality. 1997 again achieved a Return on Equity in excess of 15%. We received, entertained, and instructed eleven bankers from Russia and this was truly a mind-broadening experience. We were awarded a Five Star rating from Bauer’s, one of the foremost performance evaluators. Continued preparation (and acquisition) of equipment, during 1998, prepared us for the Millennium (called Y2K in our industry). The costs throughout the years immediately prior to the year 2000 were far out of proportion to any value which ensued. Three more valued, long-time employees retired. At mid-year, 1999, Rollin Dart, after serving as Chief Executive Officer for 37½ years (for more than half of the time that the bank had been in existence) passed the baton to Ronald Rhoades. Rollin continues to spend full-time at the bank (one bank or another), albeit at a more leisurely pace. During the period of Rollin’s tenure, the bank had increased in size from $8 Million plus dollars to more than $179 Million dollars. This period was characterized by continuous moderate growth and meaningful profitability. Our stock had become more community oriented and less concentrated in the founding families. We had grown in stature and had become more of a people-oriented organization. We had truly become a more “caring” team. So, effective July 1, 1999, Ronald Rhoades, who had worked with Rollin for twenty-six years, became President and Chief Executive Officer. Ron, raised in Gladwin, with a finance degree and some background with the Bank of the Commonwealth in Detroit, had truly been a credit to our bank. Rollin continued as Chairman of the Board of Directors until April of 2005, at which time this responsibility was also added to Ron. The close of the Millennium produced no remarkable events. You would think that such an occasion would produce at least one or two traumatic experiences wouldn’t you? In fact, “Y2K”, which so many firms had prepared so valiantly for, and spent so many millions of dollars, was a non-event itself, chiefly because our people had more than adequately prepared us for it. The close of the millennium saw meaningful deposit and loan growth, though the pace of such growth is slowing significantly due to extremely competitive conditions. During the year 2000 we celebrated the bank’s 75th anniversary. We were blessed with a profitable year and were pleased to be able to declare a 100% Stock Dividend. A meaningful way to celebrate our 75th, don’t you think? The beginning of the new millennium (2001 through 2005) witnessed events like life itself. 2001 brought unimaginable terror to these United States. 2002 encompassed the bank’s first robbery. Our more than special person, John Coy, retired after a relationship with the bank of more than forty years. In 2003 Dart Mortgage Company was created. Also in 2003, we acquired a magnificent piece of property in Grand Ledge. This began the realization of the plan to put a community bank in Grand Ledge. This bank was underway throughout much of 2004 and we opened for business during April of 2005. We were able to share the atmosphere of our beautiful new bank with all our shareholders in March, as we were able to hold our Annual Meeting of March 22, 2005 in Grand Ledge. At mid-year 2006 Ronald Rhoades informed the Board of his wish to retire effective June 30, 2007, provided a new President and Chief Executive Officer could be in place by that time. The opportunity that retirement would provide to spend more time with Jeanne (who had earlier retired from the Michigan State Police) appealed to Ron. He served as President and CEO for eight years. He had served The Dart Bank (and Dart National Bank) for a total of thirty-three years and was key in the development of the Delhi/South Lansing Bank. The Board of Directors began a search for a new leader. After considering several candidates, the Board selected Peter Kubacki to serve as President and Chief Executive Officer, to be effective March 1, 2007. He became a Director of the Bank on the same day. Mr. Kubacki comes from a banking family. His father served banks in Manistee, Michigan, and in Pierceton, Indiana. Two of Peter’s brothers also serve community banks in Indiana. Early 2007 witnessed a significant change in the Bank. Rollin Dart and Jack Davis retired from the Board to make way for the selection of two new directors. Jack became a Director in January of 1963 and completed his service in March of 2007. Rollin continues to serve the Bank as an active Chairman Emeritus and also as the Community Relations Officer. He provides counsel to the Board. In addition to these changes, Joan Bauer, who had earlier been elected to the Michigan House of Representatives, felt that it would be prudent to retire from the Board. Because of these changes, four Board positions needed to be filled. A great deal of care was exercised in selecting three new Directors: Blake Mulder of Grand Ledge, John Grettenberger Jr. of Lansing, and Mark Henne of Williamston. The year 2008 saw changes in our facilities and in our corporate structure. A difficult decision was made to close the Cedar Express banking facility and that was completed in August. During the fifteen years it was open, changes in customer preferences for accessing and utilizing our bank led to a very low utilization of this office, and as a result it became an economic liability. Contributing also was the closing of the plant operated by Wyeth Laboratories, one of Mason’s largest employers. The concept of a separate building to serve as a store exclusively for loan customers continues to have merit. Having said this, the growth of the staff supporting our lending activities, limited office space, and an increased need to protect the privacy of our customers made it necessary to convert the loan store to an Administration Building. After a number of months of study, our Board recommended the formation of a bank holding company to be named Dart Financial Corporation. At the 2008 Annual Meeting the shareholders overwhelmingly approved this change. Accordingly, on July 2, 2008 The Dart Bank became the sole subsidiary of the holding company and shares of Dart Financial Corporation were exchanged for those of The Dart Bank. As a result, we have greater flexibility in making investments in financially related businesses and greater options in dealing with our capital stock, including the repurchase of our own shares, if desired.